Lifestyle: I like that I have a pretty impressive network. I like that I live in Atlanta and have access to many opportunities. I like that I am still connected to my hometown of Jackson since it holds a special place in my heart. I love that I get to travel and explore. Work: I love the level of support I get from my management. They genuinely care about me as a whole person, not just as an employee. I also love that I’ve found a place where I can apply my math skills to being a do-gooder in communities across the country. I also like that I am diversifying my portfolio by not just doing research for projects but also helping with marketing and the operations side. Finances: I appreciate the fact that even though I don’t receive help from the person I expected it from, I’ve never missed a meal and Frederick has everything he needs and more. I like that I truly have my mom’s support and that she’s been my security net. Health: I like my weight. I like my newfound upper body strength. I like that I eat mostly fresh and organic foods now. Thanks x3, Frederick. Family: I love being Frederick’s mother. I like seeing my son develop and flourish everyday. I love hearing him laugh and seeing him discover new things. I love his hugs and kisses. I love watching (and hearing) him sleep. I love the way he looks like he is going to tip over when he is walking full speed ahead. I love to hear him say new words. I love reading and singing to him. Also, I love my mom and my daddy and my brothers. I love my aunts and uncles and my cousins. I love that I still have a living grandmother. I love that all these people love me. I love that even though I live 6 hours away, I still have a church family that loves me and my son. I like that Frederick and I have a village. Relationships: I like that I have friends who speak life into me when they notice I’m low on fuel. I like that I have friends who believe in me. I like that most people who have made even a brief connection with me like to keep in touch with me, which I think means they see value in knowing me. So 2 days down, 29 to go! FYI – if you read my pregnancy posts, I used the same password on yesterday’s post. I’ll make it public sooner or later, but until then, hope you remember the old password! Yesterday, I attended the Many Voices, One Goal conference in Raleigh, North Carolina, where public and private stakeholders came together to discuss ways in which North Carolina can continue to work together to achieve the ambitious goal of preparing ALL children for college or career. North Carolina was one of the states awarded federal Race to the Top funds in the second round of competition. Governor Beverly Perdue, who holds a Ph.D. in Education Administration, announced in January 2010 her education agenda: Ready, Set, Go, which has a goal of making sure every child in North Carolina is college or career ready. Gov. Perdue, plans to achieve this through four pathways: great teachers and principals, quality standards and assessments, new data systems that track students from their first day, and a turnaround of lowest-achieving schools. During her address, Gov. Perdue stated what we at Market Street believe: “You’ve got to have a skilled workforce, purely and simply… Jobs and education are inextricably tied together for a common goal.” After giving more details about each component of reaching the goal of preparing ALL students in North Carolina, she left us with this: “The history of North Carolina is still being written. This chapter belongs to us. It’s our opportunity to transform a child’s life…” This is what took me from saying that her goal was lofty to ambitious. She gets it. She KNOWS that she has to reach those kids on the margin to improve the lives of everyone. We can’t continue to ignore those “doomed to fail” if we really are looking at our long-term future. As Whitney Houston said, the children ARE our future so we have to prepare them all, not just some. Dr. Uri Treisman, a professor of mathematics and public affairs (MY kinda guy!!) at UT-Austin and considered an expert in education innovation, gave a keynote that highlighted America’s strengths in education. He said that although we have a ways to go to improve, that we should give ourselves credit for the progress we’ve made. Dr. Treisman stated that when it comes to the TIMSS (Trends in International Mathematics and Science Study) educational metric, the US performs better than all European countries. Minnesota and Massachusetts, who have chosen to be ranked along with the nations, both outperformed Japan, and Massachusetts did just as well as Singapore. However, the United States ranks 25th of 30th in the PISA (Program for International Student Assessment). The difference, according to Dr. Treisman, is the TIMSS focuses on procedural knowledge, or how to follow rules, while PISA focuses on the ability to use knowledge in unfamiliar situations. He asserted that in order for our students to have the ability to solve creative problems, they need an education that balances both of these. *Lightbulb* The second part is critical thinking–something we’re constantly complaining about, esp with the Millennial generation. Education reform can’t just be about passing tests and getting through school. It HAS to be about preparing students for LIFE. This discussion of policy from a mathematical and statistical perspective, just my cup of tea, was really interesting, and I think the folks in the audience got some great ideas about how to approach reform issues. EE Miller Elementary in Cumberland County, which is a part of the Global Schools Network – the third graders presented a powerpoint presentation about insects entirely in Spanish, which they’ve been learning since Kindergarten. The group was multi-cultural, and about 4 of them were black. It was something else to see these little people grabbing for the mic, not shy in the least, to show off their science and Spanish skills. For my teacher friends who will appreciate this: the principal of a school in a small, rural, county told us about The Collaborative Project, which is sponsored by the NC Public School Forum and the NC Science, Mathematics, and Technology Education Center to provide quality staff development. The program has greatly increased the success of teacher recruitment and retention in these areas by providing teacher financial incentives and hands-on learning opportunities throughout the year. A student from KIPP Institute in Gaston told us about how the school has turned a peanut field into an innovative school that expects and prepares each student to attend college by engaging families and the surrounding community. Their students have been accepted to schools all over the country and have seen very positive results. This student has already been accepted to several of the schools, including Morehouse, to which he applied and is waiting on a few more responses. He was a great public speaker–you could tell he was nervous, but he held his own, with great volume and clarity and not reading from his slides. A group of students from Anson New Tech High School split up and spoke with each table in the room about their school’s programs and opportunities. The school, which promotes “trust, respect, and responsibility,” focuses on project-based learning and a wide array of technologies. The students work on oral presentations, team work, and individual learning, while weaving in technology in all facets of school. An afro-wearing kid came to my table and chatted enthusiastically about the projects he’s worked on and how in team situations, they could fire someone not pulling their weight. Armed with his Macbook that each student has but has to earn the right to take home, he let us listen to a song he created, beats and all, for a math project. “If we’re going to have a successful democratic society, we have to have a well educated and healthy citizenry.” — Thomas Jefferson. Now y’all know I think some people are a-ok with uneducated folks because then they don’t question anything. If we want kids who will be engaged in what’s going on in our communities and nation, we need them to be able to think critically and ask questions–not just go along to get along. In the early 1800s, education was a means to ensure social order. That still applies. When you’re prepared for a good job, you’re less likely to get into mischief. When Jackson was off the chain crime-wise, I was telling folks that crime fighting wasn’t the sole answer–economic development is important too. You have to give folks something to do. Idle minds are a devil’s workshop, right? In the late 1800s, as the country was moving away from farming and such to manufacturing, workers and leaders needed training to make that transition. The same applies today as we move into the “New Economy” that is so intertwined with technology and innovation. Finally, education was necessary to enable to the South to face the future as a part of the country. Well… many southern states at at the bottom of so many of the rankings lists. Again, we need to pull up the margins to pull up competitiveness. The final keynote of the day was from Dr. Linda Rosen, CEO of Change the Equation, which was launched in 2010 after President Obama reached out to the leaders of Xerox, Kodak, Time Warner Cable, Intel, and Sally Ride Science. Change the Equation is a nonprofit, non-partisan initiative to solve America’s innovation problem. Their goal is to improve STEM education for every child, with a particular focus on girls and students of color, who have been underrepresented in STEM fields. Dr. Rosen told us that although corporations give a half billion dollars in philanthropy in STEM learning, it hasn’t been as effective in return on investment and her organization plans to reroute those funds to ensure efficiency and effectiveness. They are currently developing design principles for philanthropy—ensuring that organizations who receive the money fit within criteria that are most likely to see results. They also plan to release this spring STEM Vital Signs, which will start with a compilation of existing state STEM data and evolve to include new data not currently available. North Carolina is positioning itself to become a model for other states, and I applaud their efforts. They’re reaching into rural areas and low-income areas to try to figure out how to bring everyone along. I hope that other places (ahem, Georgia, ahem, Mississippi, ahem, keep naming states until I start forgetting them) get the idea asap and follow suit. I discovered this report published by the Schott Foundation today, and my heart is heavy. Just take a look at some of these stats. Nationwide, in 2008, white male students graduated at a rate of 78%, while black male students graduated at a rate of 47%. The gap has widened–in 2006, white male students graduated at a rate of 75%, which means there was a 3% increase over the two year span. Black male students graduated at a rate of 47%–no change. The ten lowest performing states (including the district) for black males are: GA (where I live – 43% graduation rate), AL (42%), IN (42%), DC (41%), OH (41%), NE (40%), LA (39%), SC (39%), FL (37%) , and NY (25%). Side note: 25%?!?! 25%, New York? Whoa!!! The graduation rate for white males was 68%! That’s a 43% gap! The ten best performing states for black males are: ME (98%), ND (93%), NH (83%), VT (83%), ID (75%), MT (73%), UT (72%), SD (71%), NJ (69%), and IA (63%). Side note: Now, this is good and all,… but I will have to pull the population data for these states to see just how many black male students were there in the first place. Two of the best performing large districts for black males are in GA: Gwinnett County (58%) and Cobb County (51%). Now, listen, I know that everything in this report can’t be fully analyzed (and please remember that this report provides more than just graduation rates–it also has reading and math test average scores, advanced placement, special education, and discipline data) until they are put in context (I do this every day for a living). BUT, at the surface, it’s obvious that we have a problem, a serious one. Here are my initial thoughts in reaction to this report. :: Coupled with the incarceration rates of our black men, this is certainly alarming. Our futures are in jeopardy if we can’t reel this on in. When folks start droning on and on about the plight of the educated black woman, this is the stuff we really need to be focused on–the root of these problems. If you think black women can’t find suitable mates, then we need to figure how to reverse this–not let it fester and perpetuate. The black community is at danger when we can’t get our kids through the bare minimum level of schooling. And we’ve known this, right? But now, here it is staring us in the face through this report. So what we gone do now? :: Yes, it’s time for my me vs. we soapbox. So many of the black community’s problems are embedded in the fact that we have become so disjointed from each other. So many of us go day to day thinking about only ourselves and our short-term happiness. And while those are certainly valid thoughts, we should also be thinking about our community and our collective long-term happiness. Yes, the parents are responsible for their kids, but I still believe the African proverb that it takes a village to raise a child. We need to be reaching out to those less fortunate than us through mentorship and even advocacy. Give up a weekend to volunteer with an organization that focuses on our youth. Skip a couple of coffee breaks and donate that money to charity or your alma mater or to buy a book for a neighbor’s child. There are so many ways we can get beyond ourselves and redevelop our interconnectivity. And that’s vital. :: Black folks aren’t the only ones that should be worried about this. Listen here–the performance of each and every one of our kids is factored into the overall graduation rate. Guess what–if we can get these rates up, the overall rate will increase as well. How can we expect to have competitive communities if we aren’t effectively training our future workforce? It’s no wonder (besides other educational factors) that the U.S. has gone from #1 to #12 in college completion rates for young adults in one single generation. This has a direct impact on how competitive this nation is compared to other countries. As I’ve said time and time again, what we do for our kids today molds what our society will look like tomorrow. And guess what–you can support the cost of quality public education today or you can support the cost of programs that support the unemployed and those not even in the labor force tomorrow. You can run, pulling your kids out of school and putting them in private schools instead of getting involved with the local school board and making your concerns heard through local politics, but trust me, you. cannot. hide. Uneducated kids grow up to be uneducated or miseducated adults. (Sidenote: I mean, educated kids can grow up to be miseducated as well, but that’s not relevant to today’s post, so moving on…) We cannot continue to be okay with shortchanging our kids. :: Y’all know I’m not a problem-oriented person. I’m solution-oriented. So what do I want you to do? I want you to read this report and really think about the repercussions. Tell me how you feel about it in the comments. Then I want the mentors, tutors, volunteers, philanthropists, and advocates out there to keep doing what you do, and I want the teachers to continue going into those classrooms and busting your patootie everyday even though you are likely underappreciated. I want you guys out there to continue (or start) reading the news and keeping up with issues like this one that impacts us so adversely. And I want anyone who is looking for something to do to become a mentor. You don’t have to be well off to be a mentor. Join Big Sisters/Big Brothers or go through your district to see what opportunities are available or take some interest in someone at your church and be a light in a kid’s life. Show them that they are cared for and encourage them to be their best. Just because you can. It only takes an hour here or there to make a difference. Do your part. Are you ready for the primary? One of my favorite sets of childhood memories is riding down to the neighborhood fire station with my mom to vote. Several of my family members were poll workers, so it was always a friendly experience that I looked forward to. The best part of the going to the poll was fake voting. 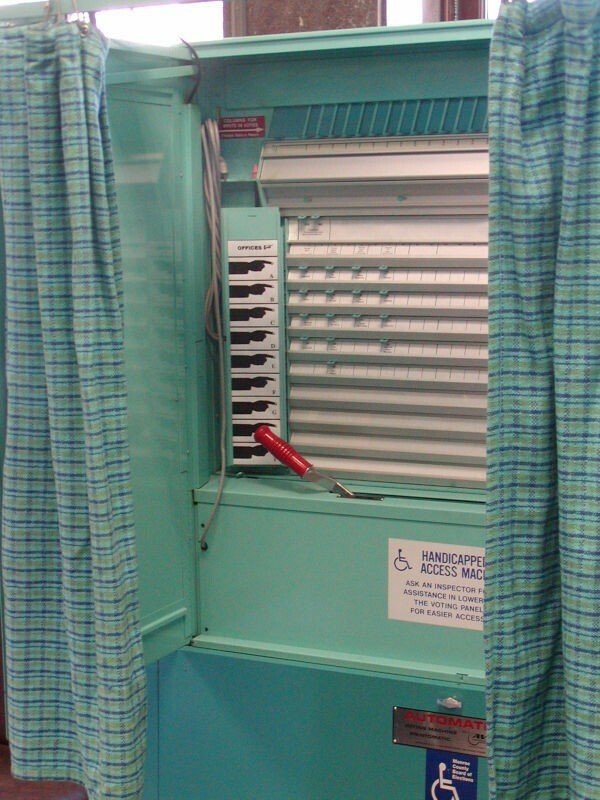 🙂 There were child-size voting machines there, so I got to click down the old school pegs and “cast” my vote as well. I’m sure this is one reason I’m civically engaged as an adult. On Saturday, July 10, 2010, from 8:30 am to 5 pm, Fulton County is hosting its first Family Voting Day. Serving a dual purpose, this event will allow yet another opportunity to cast ballots for the primary election early, and it encourages families to vote together (and expose kids to the duty of being heard through voting). It’s important to vote–but it’s imperative to be an educated voter. If you’re a Fulton County resident, below are some links to help you prepare for the Tuesday, July 20 primary. If you’re not a Fulton County resident, please visit your state’s Secretary of State website and your county government website to find information on registering to vote (deadlines and rules), poll locations, and candidates. Be engaged in your community. It’s too late to register to vote in the upcoming primary, but here is the link to future registration deadlines and election dates. You can still register to vote in future elections. Here’s a great guide to voting regulations in GA. Need to check your voter registration status or find out where your poll is? Click here. Are you not able to vote on the 20th or attend Family Voting Day? Here are the locations for early voting. Don’t know what we’re voting for in this election? Here are sample ballots: Democratic and Republican. Finally, for more information about the candidates, visit this site. Get involved. Remember that local politics are just as, if not more, important as national politics. Don’t just complain–identify your issues and make your voice heard. Voting is your bare minimum civic responsibility. Do your part.